Are condo renovations different than traditional home projects? There is not much that separates our creative approach to home and condo renovation projects, spare a few special considerations. These unique considerations present little difference in the degree of difficulty of a condo renovation compared to a traditional home renovation. The truth is, there is always an unlimited potential for you to completely transform the look and feel of any condo unit with great interior design. For interior designers, the prospect of a condo renovation allows us to think outside the box and pursue new paths and designs that remind us just how rewarding our work can be. We’ve been able to add, remove, and transform condo kitchens, bathrooms, and bedrooms, in ways that completely change the entire look, function, and feel of a unit. 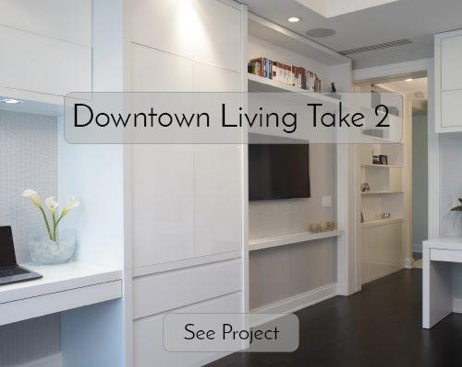 As examples of what we can do with a condo renovation, see the two finished downtown Toronto condo projects below. With any renovation project, the whole process is made much easier when all the work is signed off on and approved by the Condo Board ahead of time. Condo Board’s need to approve almost any work done in a unit. In most situations, the Board will want to work with the condo owner to get the renovation completed as it will increase the value of the condo building. Generally, the renovation project will not be impeded as long as the condo owner stays within the Board’s defined parameters and the plans proposed are well thought out. Once Condo Board approval is gained, it’s always a good idea to warn the neighbours of the upcoming renovation project. The last thing a renovator would want is an upset neighbour complaining to the Condo Board, potentially stalling the project. With that in mind, it may be worth giving neighbours a quick heads up, the hours the contractors will be working, or maybe a little gift basket to say sorry for the noise in advance. In any traditional home, the kitchen is the heart of the home. The same is true for a condo. Ventilation and the sink drain can pose an interesting challenge. If you are trying to change the location of your hood vents and sink, the option of extending the pipes & ducts may be possible, provided there are no issues with the structural walls behind the kitchen. Access to gas for an oven should also be considered. If a gas hook up already exists, then a new oven can continue using gas. However, if the condo building does not have a gas hook up, then electric will have to be used. When adding additional (or larger) electric appliances, the power supply of the unit should be considered. The challenges with a condo bathroom lies in the fact that the shower/tub and toilet drains cannot be moved. That being said, there is still much you can do. Crayon Design can explore options such as having the showers, tubs, and sinks rotated, reduced in size, or switched for one another. As an example, in our “High in the Sky” project, we placed the shower on a raised platform so that we could conceal extra piping for the bathtub drain. 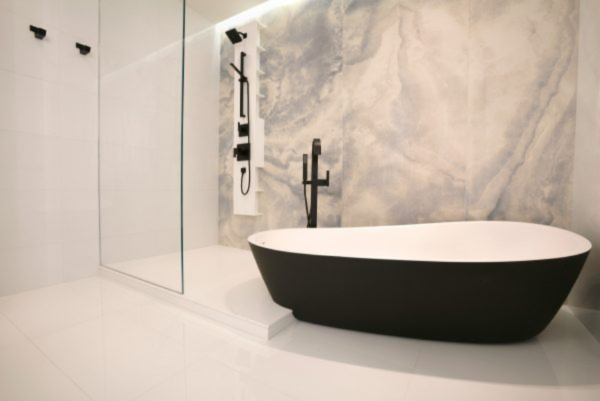 We also sourced a freestanding bathtub with a rare horizontal drain This allowed us to completely open up the room. Caption (before): Before the renovation, the large bathtub structure, as well as the shower glass pains, robbed space from the bathroom. Caption (after): Despite the fact that neither the shower or tub changed locations, the bathroom takes on a much more open and contemporary feel. Crayon Design was able to achieve this without moving drains or expanding the overall size of the bathroom. There are also many ways you can alter the way your eye sees the space. 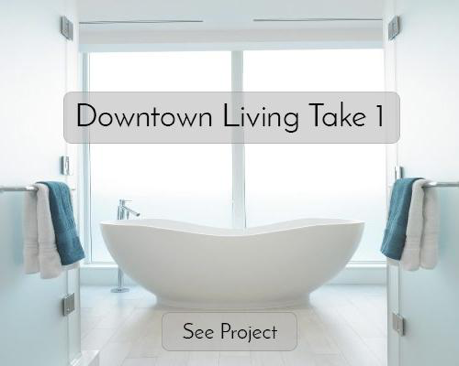 Using creative measures such as cleaning up visual elements, concealing bathroom storage and simplifying the doors, an interior designer can make a condo bathroom look and feel much bigger. The living area is typically the space that allows for the most creative expression. Often, a living space will serve double functions, like an entertainment centre that also acts as a dining room, or an office. Because it is likely the biggest room in the condo, it should be opened up to feel both inviting and warm. Using built-in storage, improving traffic flow patterns, removing hallways and choosing the right size of furniture will help create that open, warm feeling. Once the space has been defined, the furniture, artwork and colours allow the homeowner to add their own unique flourishes. 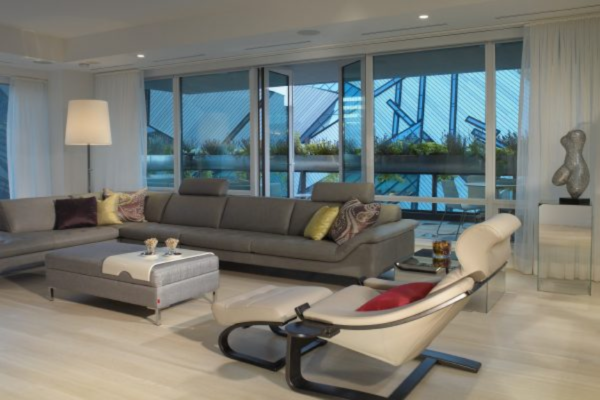 This personal expression is most prominent in the living space because it is often the largest space in the condo. Furnishing a condo unit can be challenging when looking for larger pieces. While that stunning three-seater sofa on the showroom floor would make the ultimate centerpiece for your living room, it still needs to fit into a condo’s elevator and entryway. Where flooring is concerned, many condo owners seek to replace the laminate flooring that comes with most condos with hardwood. Due to the thickness of hardwood flooring, the floor level will most likely be raised at least an inch compared to other areas of the condo. If the living space of a condo is being upgraded to hardwood, Crayon Design also recommends changing flooring elsewhere in the unit to avoid having uneven flooring between the living space and other rooms in the unit. For the floors and the walls, all forms of stone, granite, and marble are great options with no limitations presented by condo living. Related article – Creating your perfect pied-à-terre? We explore some creative approaches and insight into creating your ideal home away from home. Read more. The placement of electrical outlets is crucial in both bathrooms and kitchens. 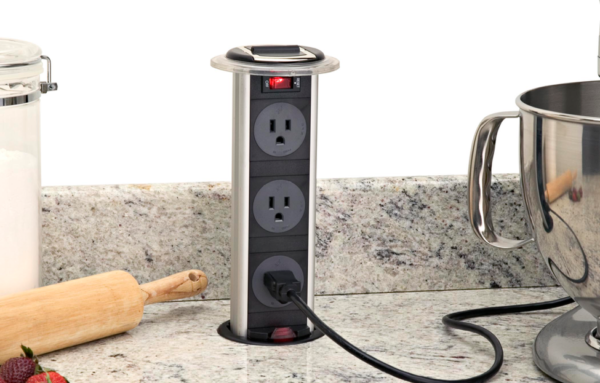 In an effort to make outlets as inconspicuous a possible, while still being properly positioned, initial design plans need to take them into account. There are several interesting ways they can be hidden and incorporated into the design of the room, like the pop-up powerstrip solution seen below. Caption: One of the many ways you can conceal the presence of electrical outlets in a home. Where lighting is concerned, most condos do not have enough space in the ceiling to install pot lights or any other deeper structures in the ceiling or walls. Shallow boxes or pancake boxes can make up for this. Almost all condos have one or two key structural walls that are concrete with very little room to work with. It’s highly unlikely that these walls will be able to be changed significantly. Besides these structural walls, almost all other walls will be completely changeable, allowing an interior designer to completely re-organize the layout of the unit. Soundproofing between rooms and/or units. drywall is often not added to ceilings and some walls. the electrical systems are usually hidden in walls instead of the ceiling and it is more common to find vertical support beams that cannot be moved or changed. It is also very common for nearly all interior walls to be moveable – allowing for more adaptability in lofts. The next time a friend or family member suggests that condo renovations can be overly difficult, encourage them to think again. With great interior design and proper planning, there are so many ways you can make your space serve your lifestyle better.